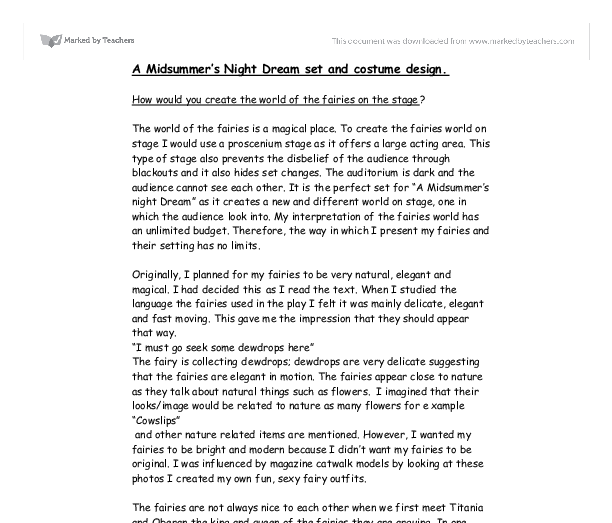 A midsummers night dream - How would you create the world of the fairies on the stage? How would you create the world of the fairies on the stage? The world of the fairies is a magical place. To create the fairies world on stage I would use a proscenium stage as it offers a large acting area. This type of stage also prevents the disbelief of the audience through blackouts and it also hides set changes. The auditorium is dark and the audience cannot see each other. It is the perfect set for "A Midsummer's night Dream" as it creates a new and different world on stage, one in which the audience look into. My interpretation of the fairies world has an unlimited budget. Therefore, the way in which I present my fairies and their setting has no limits. Originally, I planned for my fairies to be very natural, elegant and magical. I had decided this as I read the text. 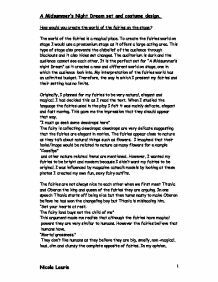 When I studied the language the fairies used in the play I felt it was mainly delicate, elegant and fast moving. This gave me the impression that they should appear that way. "I must go seek some dewdrops here" The fairy is collecting dewdrops; dewdrops are very delicate suggesting that the fairies are elegant in motion. The fairies appear close to nature as they talk about natural things such as flowers. I imagined that their looks/image would be related to nature as many flowers for example "Cowslips" and other nature related items are mentioned. ...read more. "I jest to Oberon, and make him smile" For my fairy world I wanted my audience to believe they have just walked into new world full of magic and mystery. I have decided that my fairy world is going to be hidden by a waterfall. The waterfall will create a link between scenes and also create a distraction. So some scenery can be changed. Behind the waterfall will be the magical world of the fairies. The water would combine with music to give a feeling of magic; the sound of a harp would create this feeling, as it is a very beautiful musical sound. Lighting gels could be projected onto the water giving different colours. This would change the mood and atmosphere of the production another magical effect. Once the water has stopped, the stage is revealed. On the left side of the stage there is a huge tree. Behind this tree is a pole from which the fairies enter. This idea came from the idea about the cyclorama projection. As the background isn't real I decided that if the fairies had a different entrance from the humans their world would look separate making it more realistic. However, Titania and Oberon would not use this entrance to show their authority. They would enter upstairs next to the cyclorama. For Thesus's palace the tree would be turned around and a stone column would cover the pole replacing the tree. ...read more. Lighting also creates atmosphere and location therefore it is an important element of my production. I can use lighting to show different settings and hide some immovable scenery. Lighting helps to create a deeper look into the world of the fairies and to extend the limits of the stage. I would use gobo projections of a village showing where the fairies live in the forest scenes. During other scenes the cyclorama would be plain black. I designed a projection to include a river, which connects with the idea of the waterfall. To show movement and activity so that the cyclorama isn't just a picture I think that a little lights should move around on the projection suggesting fairy movement. Several small spotlights moved around throughout the production would bring the fairy world alive. The scenery used includes architectural and projected images, which can be changed instantly. My "Midsummer's Night Dream" production would use lighting, music, pyrotechnics, set design and costumes to create the world of the fairies. I wanted to create a very modern, fun and different world on stage. I am particularly impressed with my costume design and my waterfall idea. I think that these ideas would benefit a production of "A Midsummer's Night Dream" because they are different and entertaining. The costumes show a connection to the human world whereas the waterfall shows a distinction to the type of lives the fairies live. The waterfall gives a feeling of magic and mystery. These are two aspects, which I wanted to portray in my production. A Midsummer's Night Dream set and costume design. 1 Nicola Laurie ...read more. They fear that they will startle the ladies by having a lion in the play, so they add a part where the lion tells the audience that he is actually a man pretending to be a lion. The actors feel that this is appropriate whereas the audience see it as funny. Consequently, in "A Midsummer's Night Dream" Thisbe who is a woman would have to be played as a man, which would bring humour to the audience. In the time of William Shakespeare there was a strong belief in the existence of the supernatural. The costumes should be boot leg jeans and polo neck jumpers. The style may vary in the cloth department. I think that the lighting should be dim or low because in a night club it's usually dark but we could have the dim lighting so that the audience could see what was going on. The lighting will also change to make things appear to be magical, the main colour used will be green to show they are at one with nature and make it appear as if it is set in a forest. The library where Judith works occupies the space taken earlier by the pub. Mark's house is also used in the same location as the pub, with a table and a bed displaying its purpose. Another unique set design was the presence of a vertical come 3-D bed on top the girls' room where Patrick slept.